Debbie Ward has been a burn survivor for over 50 years and is a very active member of burn support systems. Along with being elected as the secretary/treasurer for the Canadian Burn Survivors Steering Committee, she is the president of the Nova Scotia Burn Support Group. But Debbie didn’t speak about being a burn survivor until over forty years after her burn injury. Debbie was seven when her accident happened. The incident began when a neighbour came by her family’s apartment and asked to borrow some sugar. Because Debbie knew it was in the cupboard above the stove, she grabbed a chair to reach for it. But Debbie didn’t know the burner was on and her clothes caught on fire. Debbie was burned 70 per cent from the bottom of her knees to her chin. Panicked, the neighbour ran away. Debbie’s mother on the other hand, got help from another neighbour who rolled Debbie on a carpet and put the fire out. Because of the close quarters of the apartment complex, other neighbours found out about the incident immediately and called an ambulance and stayed with Debbie until help arrived. It took 45-minutes for the ambulance to arrive. As everyone waited Debbie’s mother was convinced her daughter was going to die. After repeatedly telling her to relax, one of their neighbours slapped Debbie’s mother to calm her down. Debbie’s burns were treated very different from today’s standard. For example, there wasn’t burn units. Instead Debbie was admitted to a room in the children’s hospital that was isolated from the rest of the hospital. The hospital was so particular about keeping things sterile that even siblings weren’t even allowed to visit. She was in that room for six months. Another thing that wasn’t practiced yet was induced comas, which meant that Debbie was put on different types of medication that would cause Debbie to sleep. This was especially difficult because whenever she woke up, she always thought the room was on fire because the curtains in her room were yellow. Although the hospital tried to change the colour of the curtains, they had to eventually take them down altogether because Debbie couldn’t stop thinking they were on fire. According to Debbie, during the time of her burn injury if you had any kind of disability or deformity you were usually hidden away. Debbie’s father’s way of dealing with her burn injury was that whenever anyone came over, or they went out, she was put on display and had to show her scars. Debbie’s mother would never acknowledge the accident and would shiver at the mention of it. Debbie’s family wasn’t the only ones that had a reaction to her burn injury. People that Debbie thought were her friends disappeared because her burn injuries caused a lot of limitations, which meant she couldn’t keep up with other children. She was seen as a burden. As a result, Debbie spent most of her young life alone in her room. 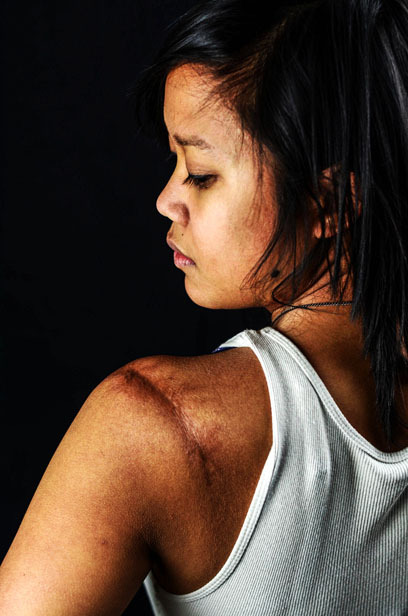 Debbie’s challenges as a burn survivor continued into her adulthood. Because she was burned as a child, and her skin was still growing, Debbie had to go to the hospital every year for 47 years to either get some burned skin released because it was too tight or have a graft put in. Even with so many trips to the hospital, Debbie never met another burned person. It wasn’t until the nursing unit called her in 1999 to let her know that fire fighters were doing a burn camp for adults and children and that they wanted her to go. Debbie agreed. But as the camp got closer, she felt more nervous. Nerves aside Debbie ended up going, but when she walked into a room full of burned people she felt overwhelmed and wanted to go home. Having never seen another burned person, she thought they would all look like her. She didn’t expect to see facial burns and other more noticeable burns. Although she was preparing to leave, the burn camp facilitator sat her down and convinced her to give it a try. In the course of three days, everyone else admitted feeling the same way as she did. But the beginning of the camp had a sharp contrast to how it ended. Everyone had come into the camp fully clothed with long sleeves and long pants to cover their burns, but ended up wearing shorts and t-shirts at the last day. During that time they laughed together, but also cried a lot because it was the first time for a lot of them to finally speak about their experiences as a burned person. Finally, they found others who understood what they were going through. The following year, Debbie went to the Phoenix Society’s World Burn Congress, an international conference for burn survivors. Again, Debbie felt uneasy and wondered if she belonged there because there were people that were much more burned, including those missing limbs or with severe facial burns. It wasn’t until a man standing beside her asked her why she had a funny look on her face that Debbie voiced her doubts. The man reassured her that she belonged there and that she was a survivor just like everyone else. It was the first time Debbie had heard “survivor” associated to a burned person because for 40 years she thought of herself as a victim of a fire. As Debbie got more involved with volunteering her time to the burn support community, she also noticed her attitude change. Through different workshops she realized that other people in her life were just as traumatized by her accident as she was. When she talked to them they told her they were surprised that it took 40 years for her to talk about it. She also began to see the repercussions of her burn injury through her children. Because Debbie felt like she had lost her childhood and was forced into adulthood, she didn’t know how to interact with her children in certain ways. She didn’t know how to play childhood games because she was always in the hospital. Another thing Debbie noticed was that none of her adult children learned how to cook because she never let them near a stove. Debbie was chosen as the president of the burn support group. This involvement grew when the seed of the Canadian Burn Survivors Community began. After there was interest shown at a World Burn Congress, the international burn survivors conference, to create a Canadian conference, and trying the first one out in Winnipeg, Debbie was voted in as the board secretary/treasurer. Debbie and her son Andrew speaking on a panel at the 2012 Canadian Burn Survivors Conference. Andrew also is involved in the burn survivors community and is the technical support for the Canadian Burn Survivors Community. Debbie feels like there have been a lot of positives with being a burn survivor. She has realized there was a part of her that wanted to give back to people. Debbie also goes to schools and gives talks about fire prevention. As well, through the justice department she gives information to kids that have been charged with arson to let them know the effects their actions. Debbie lives in Nova Scotia. Along with having adult children, she is a foster mother. Hi Debbie….. this is great site… thanks for sharing it, I added a link to it on the burn camp web site…. Wonderful story Debbie! I am a fellow burn survivor and was burned when I was 3 years old. I am now 33 and it wasn’t until the last 5/6 years that I began to share my story and experiences with people. I understand not talking about it-it took me a while to get comfortable sharing with others my struggles. I have been to the World Burn Congress and am so thankful for the chance to meet so many other burn survivors. It is a truly wonderful experience! Thanks again for sharing! All written material and photography on this website is original content by Maria Cristina Laureano (Creator of After the Cocoon). This is protected by Copyright. None of these can be used for any other purpose without the permission of the Creator. Maria Cristina Laureano is a communications student in her final year of her studies. This website is her graduation project, which focuses on Canadian burn survivors, including Laureano's experience as a burn survivor.